installation view at 8th berlin biennale, kw, berlin. 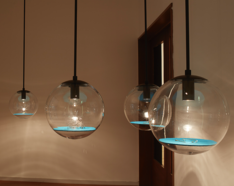 installation view at galeria luisa strina, sao paulo. 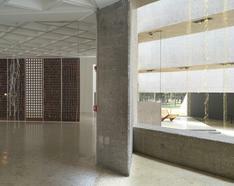 installation view at museo experimental el eco, mexico city. installation view at kunsthalle basel, basel. installation view at kiosk, ghent. installation view at centre d'art contemporain de bordeaux, bordeaux. installation view at sharjah biennial 12: the past, the present, the possible, sharjah. installation view at kunsthale lissabon, lisbon. installation view at new museum, new york. installation view at sfmoma, san francisco. 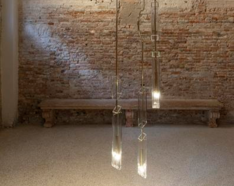 Engaging with the history of 20th century architecture, design, and art, Leonor Antunes reflects on the function of everyday objects and the potential of modernist forms to become sculptures. She investigates the coded values and flow of ideas embedded within objects and transforms them into reimagined abstract structures. Integrating materials such as rope, wood, leather, and brass, Antunes quietly rattles the aesthetic traces of modernism to foresee a revived way of thinking: looking forward by looking back. Borrowing from vernacular traditions of craftsmanship from South America, Mexico, and Portugal, the artists seeks to understand the construction principles behind rational designs and the process of reducing reality to a geometric abstraction. 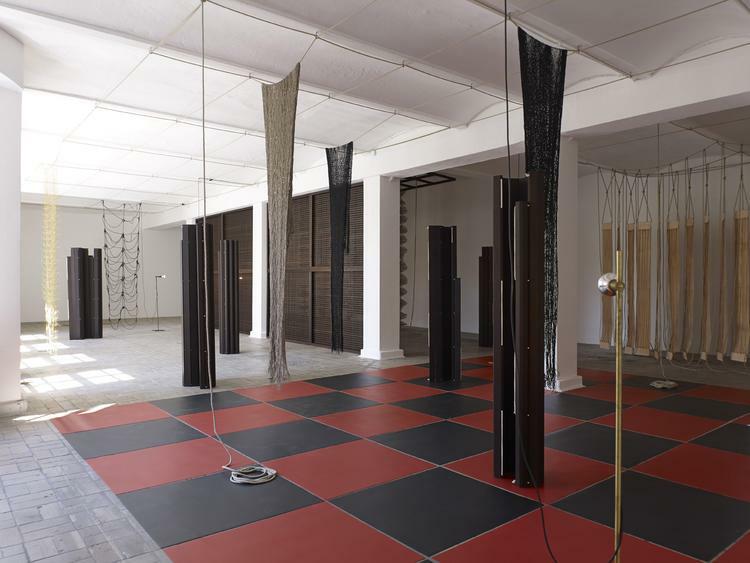 The grid, present in most of the art works, objects, and buildings she references, is transformed into brass nets, interlaced and knotted strings, leather straps, and looms of hand-woven cotton threads. She finds inspiration in the practice of female artists: their radical social and political stances and their practical improvement of everyday life through art and design. 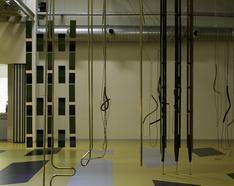 Leonor Antunes’s most important solo exhibitions include: Leonor Antunes, Pirelli HangarBicocca, Milan, Italy (2018); the frisson of the togetherness, Whitechapel Gallery, London (2017); Discrepancies with G.G. Tensta konsthall, Stockholm (2017); a spiral staircase leads down the garden, SFMOMA San Francisco Museum of Modern Art, United States (2016); the pliable plane, CAPC musée d'art contemporain de Bordeaux, France (2015); I Stand Like a Mirror Before You, New Museum, New York and KIOSK, Ghent, Belgium (2015); Leonor Antunes, Pérez Art Museum Miami, United States (2014); a linha é tão fina que o olho apesar de armado com uma lupa, imagina-a ao invés de vê-la II, Kunsthalle Lissabon, Lisbon (2013); the last days in chimalistac, Kunsthalle Basel, Switzerland (2013); le hasard est l'ennemi de tous les mètres, Maus Hábitos, Porto, Portugal (2012); villa, how to use, Kunstverein für die Rheinlande und Westfalen, Düsseldorf, Germany (2012); casa, modo de usar, Serralves Foundation – Museum of Contemporary Art, Porto, Portugal (2011); discrepancies with M.G., Museo Experimental El Eco, Mexico City (2011); walk around there. look through here, Museo Nacional Centro de Arte Reina Sofía, Madrid (2011). Recently, her work has been included in group exhibitions such as: Civilized Caves, Ladera Oeste, Guadalajara, Mexico (2017); Condemned to be Modern, Los Angeles Municipal Art Gallery (LAMAG) (2017); Potency and Adversity: Art from Latin America in the Portuguese Collections, Galerias Municipais de Lisboa: Pavilhão Branco, Pavilhão Preto, Lisbon (2017); Ficciones y territorios: Arte para pensar la nueva razón del mundo, Museo Nacional Centro de Arte Reina Sofía, Madrid (2016); Conversas: arte portuguesa recente na coleção de Serralves, Serralves Foundation – Museum of Contemporary Art, Porto, Portugal (2016); Function Follows Vision, Vision Follow Reality, Kunsthalle Wien, Vienna (2015); Slip of the Tongue, Punta della Dogana, Venice (2015); Beyond the Supersquare, The Bronx Museum of the Arts, New York (2014); Attention Economy, Kunsthalle Wien, Vienna (2014); Decorum, Musée d’Art moderne de la Ville de Paris (2013); Phoenix vs Babel, Fondation d’entreprise Ricard, Paris (2008); Acquisitions récentes, Musée d’Art moderne de la Ville de Paris (2007); among others. She has also been a part of 57th International Art Exhibition at the Venice Biennial (2017); Sharjah Biennial 12, United Arab Emirates (2015); 8. Berlin Biennale (2014); 12. 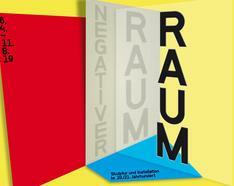 Fellbach Triennial of Small-Scale Sculpture, Germany (2013); SB2011 Singapore Biennale (2011); 1.a and 3.a ªBienal de Arte Contemporânea da Maia, Portugal (1999 and 2003). 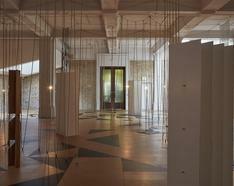 Leonor Antunes lives and works in Berlin. 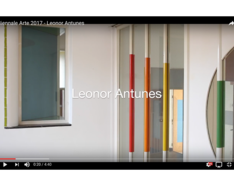 leonor antunes - discrepancies with c.p.